Making the switch from Google Sheets to Excel Online? This guide answers some of the most common questions to help you make a smooth transition. Note: Features and information in this guide apply to Excel as available through Office 365. Use Excel Online in a web browser for easy collaboration. 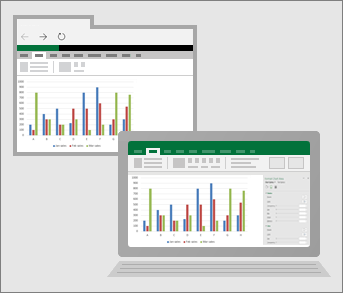 Use the Excel desktop app for more functionality. Can I work with others on the same spreadsheet? After you click a file to open it, just click Share in the upper-right. You can also work together on the file at the same time in Excel Online. This is called co-authoring and is possible with mobile devices as well. What's the main difference between Excel Online and Google Sheets? The main difference is that once you open a file, there is a row of tabs across the top instead of a toolbar and menus. The row of tabs is called the ribbon and all of your buttons and tools are there. With Office, you can use Excel Online from any web browser, or you can seamlessly switch to Excel on your desktop for rich editing features.